The bespoke Kaluga bench is available with a range of options, including a stainless or mild steel frame combined with Iroko hardwood timber slats to create a unique and contemporary seating solution. As a bespoke product, it can also be made to any desired length. Available either with or without a backrest, and with the option of armrests, the modular hot-dip galvanised frame can be polyester powder coated to any RAL colour to suit the surrounding landscape. 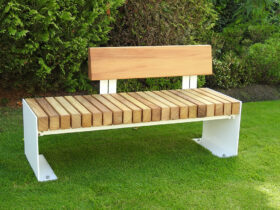 The stylish Kaluga bench is perfect for regeneration projects, college and university campuses, as well as city centres, shopping precincts and other open spaces.